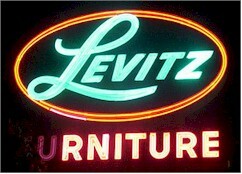 IIRC they went out of business due to financial 'improprieties'..You'll love it at Levitz..."
I guess you're right... I saw an ad for Levitz on Spotwinner - a webpage that shows ads for points... I guess I jumped to an incorrect conclusion that it was MY Levitz! Have you checked lately? According to Wikipedia (and Lord knows, they're always right :-) ), the nationwide chain folded in early 2008. Perhaps you've got a local business with that name? It's still here in NJ.